Elegant and confortable enjoys the rural feeling with all modern comforts. Sleeps 6. Aurelio, a recently converted former farmhouse, is named after Mr Aurelio V., the last of at least four generations of farmers working and living on the Tenuta Maria Teresa estate. He was born here and he lived in this house with his family until a few years ago, and it is to honor his memory that we have strived to restore the place to the best possible standards, with the same care, attention to detail and high comfort standards that mark all the houses in our agritourism estate. This fine building on two levels is beautifully proportioned and its sun-kissed location on the hilltop offers the same magnificent view over Lucca that can be enjoyed from Villa Maria Teresa, the manor house. From the housefront, a path lined with olive trees leads to the swimming pool (10×5 mt), built in a conveniently secluded position so that guests may best enjoy the quiet setting and breathtaking views. 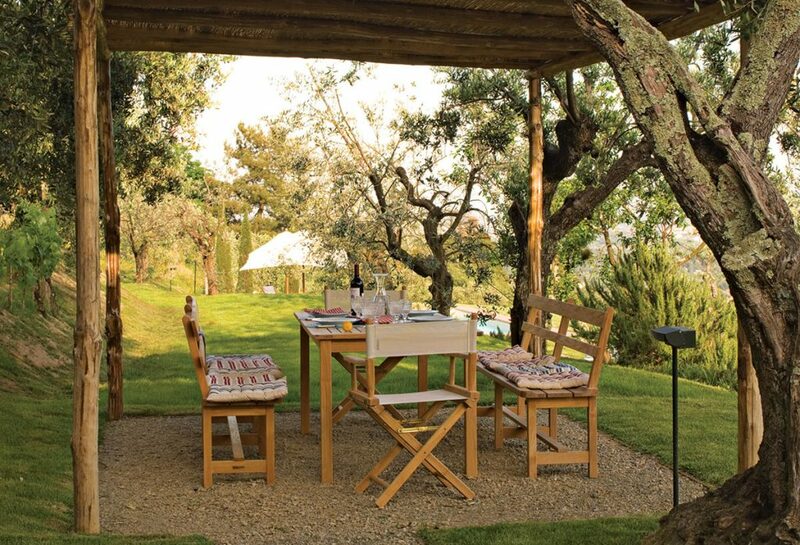 A wooden patio equipped with stylish garden furniture and a shower surrounds the pool. The property includes a large rural garden where olive trees and rows of vines alternate in the traditional fashion of the Tuscan countryside, and is fully fenced for your safety and privacy. Well behaved dogs are welcome at Aurelio’s. The front gate is automated and there is ample parking. The beautiful entrance hall on the ground floor leads into all the rooms of the living area. Adjoining the elegant dining room on the left hand side is the kitchen, in country style, but fully equipped with all modern electric appliances; opposite, a small passageway provides access to the utility bathroom with shower for daytime use and the convenient laundry room, equipped with washing machine, dryer, ironing board and linen closets. On the right there is the large sitting room, whose brick and stone walls convey a unique and very warm ambience. A large corner sofa invites guests to make themselves comfortable for merry evenings in cheerful company, watching a movie or playing cards or simply chatting in front of the fireplace, sipping a good drink. Also from the sitting room it is possible to access the garden, at the back of the house. On the first floor, the stairs reach a large reading room which serves as a hub for the three bedrooms. All the bedrooms have individual air conditioning, are stylishly laid with traditional pieces of furniture and have their own luxury en-suite bathroom. The master bedroom, with an elegantly draped king-size bed, is very spacious and enjoys a stunning view over the Lucca plain. The bathroom tiled with natural stone as all the others on this floor,has two washbasins, a bath tub and an oversize separate walk-in shower. The second bedroom, which is also very bright, has stylish antique furniture with two beautiful single sleigh beds, a wardrobe and chest of drawers. This room’s bathroom also has twin washbasins, a bath tub and a separate shower. The third room is slightly smaller, with two single beds and a bathroom with wash basin and shower. Also this room has period furniture. All the rooms in the house are interconnected by phone and each one can make direct outgoing calls (with ISDN line). Change of bed sheets and bath towels once a week. Prices are intended per week, from Saturday to Saturday.